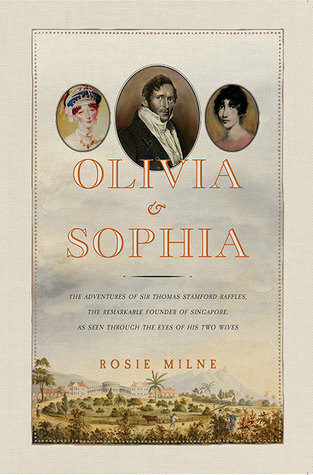 Olivia & Sophia, The adventures of Sir Thomas Stamford Raffles, the remarkable founder of Singapore as seen through the eyes of his two wives – a novel by Rosie Milne. A while ago I visited the botanic gardens in Bogor, Indonesia, with a group of friends. 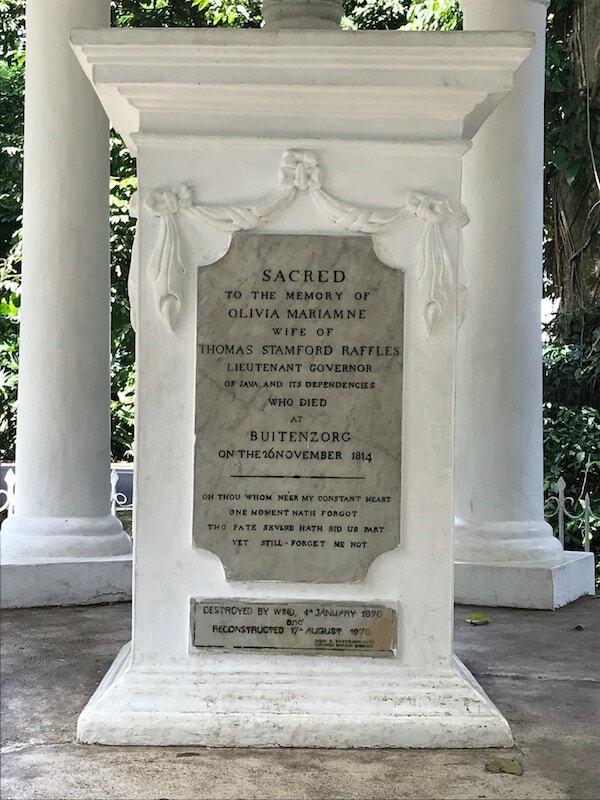 At one point we came across a monument that Raffles (the founder of modern Singapore) had built upon the death of his beloved wife Olivia, while he was Lieutenant Governor of British Java. I was intrigued to learn more about this woman who died of malaria (or so the plaque said) following her husband from England. A few weeks later, I was at the Jakarta airport on my way to Bali, and honouring my ritual of buying one book each time I travel, I came across Olivia & Sophia by British novelist Rosie Milne, as I was browsing. I didn’t hesitate for a second in buying it. Rosie Milne tells the story in the form of personal diaries of Olivia Mariamne Devenish, first wife of Sir Raffles, and of Sophia Hull, his second. It covers the time Olivia and Raffles get married until Raffles’ death in England in 1826. Through the voices of these two very different women, we follow their lives and adventures in the Far East. The author makes it clear from the start that this is a work of fiction and is not historically accurate. However, most of what is related in these women’s diaries, has actually occurred. For those like me, who have lived in South East Asia, it is fascinating to follow familiar yet intimate narratives of two trailing spouses, as they would no doubt be called today. Olivia was ten years older than Raffles. Open-minded, curious, a bit of a flirt with a great taste for life and a profound interest in the arts of different cultures. She was deeply loved by her husband, whom it is said never recovered from her death. The much younger Sophia was definitely more traditional, deeply religious and devout. Two very different personalities united by the common love for a man they considered extraordinary. The author is amazing at giving voice to such different characters within the same story. Her narrative style is almost palpable as she moves from Olivia’s to Sophia’s diary. There is almost a feeling of suspense when we say good-bye to Olivia and get ready to continue the journey with Sophia. What I loved about this book is the way it challenges in the breadth of topics and situations. It is a novel about history because it is based on characters that really existed. It is a novel about true and intense love, since the devotion of both Raffles’ wives is the thread throughout the story. It is also, and for me foremost, the story of two expat women and the hardships they had to endure to follow the man they loved. Last but not least, it is a book about discoveries, adventures and the diversity of other cultures. It has some glorious descriptions of long and perilous journeys, of arriving to new and remote places, observing the locals and adapting to different habitats, friends and whatever medical resources were available at the time. I was mesmerized by the tales of these two women and everything they went through. My curiosity wanted to know how things would end. I was pleased to read about places I know so well and the chance to imagine and revel in how they were two centuries ago. I strongly recommend Olivia & Sophia – it has something of interest for anyone.